The next time you’re hungry and need a pick-me-up, reach for Kunoa Cattle Company’s Hawaii Made Hawaii Grown Beef Bar and Jerky. These tasty Hawaii made products are not only full of protein and fiber, but they also support area farms and the community. Find out why the company makes sustainability and localism big parts of their business model and how their values contribute to the taste of their products. Kunoa Cattle Company wanted to give locals an alternative to imported beef, so they started humanely and sustainably raising cattle on the islands. The cattle eat natural plants like sedges, shrubs, grains, grasses, and trees, which promotes top flavor. Caregivers raise the cattle outdoors, ensuring the animals live a fulfilling and healthy life before making their way to consumers. The cattle don’t ingest any hormones or chemicals, only benefiting from the year-round tropical weather of Hawaii. These Hawaii made products support local farmers and butchers by keeping the business on the islands, from raising the cattle to packaging the product. Plus, naturally raising and processing the cattle contributes to a healthy ecosystem. These choices will allow the company to use the same green pastures for many years to come. Additionally, the company employs local staff in many positions on their 4,000 acres of pastureland and at their USDA-inspected butchery on Oahu, the largest in the state. Kunoa Cattle Company ultimately helps unite producers and consumers to foster sustainability and growth in the community while improving food security on the islands. 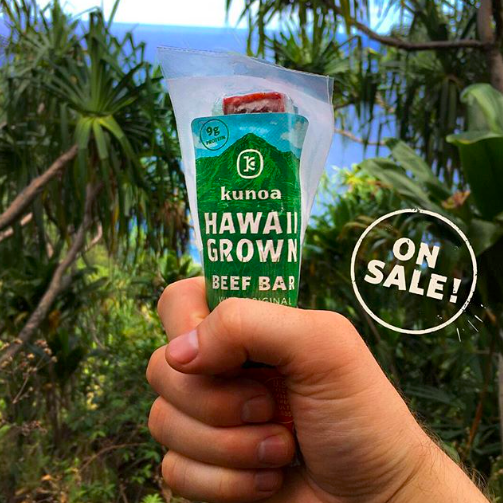 If you want to purchase Kunoa Cattle Company beef bars and jerky or other local products, visit the online store for Hawaii Made Products, based in Wailuku, HI. Their unique inventory includes natural tea, locally sourced bath salts, skincare products, and glass-blown jewelry. Call (808) 359-8600 to learn about their many Hawaii made products, and check out the website to view and purchase home decor, sunglasses, jewelry, food and beverages created in the Aloha State.